Can't believe I'm already scrapping this year's first day of school photos! Normally I don't do them until three or four years later. ;) This in no way means I'm caught up or anything, just liked the pictures I took this day and wanted to get them down on paper. 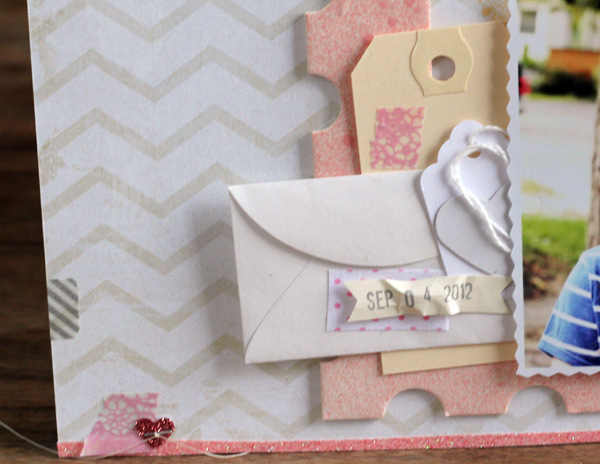 I feel like the My Mind's Eye the Sweetest Thing collection has totally changed the way I'm scrapping right now. I've actually made three separate orders of these products, because I keep using all of the paper I've bought, so need to buy more. I really love the whole collection. The colours are so pale and delicate -- but I feel like they aren't too foofy or frilly, which I think is pretty awesome. I started this page on a B-side of grey on white chevron, and used a starburst mask I cut to mist a yellow sunburst on the background. The postage stamp frame is a chipboard piece by Technique Tuesday that I've had in my stash for at least 4 years. The chipboard was already white, so it was perfect to mist. I used Pink Lemonade mist for the frame and Crepe Paper for the sunburst; both are from the October Afternoon Cakewalk collection, and I think the complement the colours of MME the Sweetest Thing quite nicely. Cute Addie Blue on her 1st day of 3rd grade. I cut the Instagram photo with pinking deco edge scissors. Love this look now! 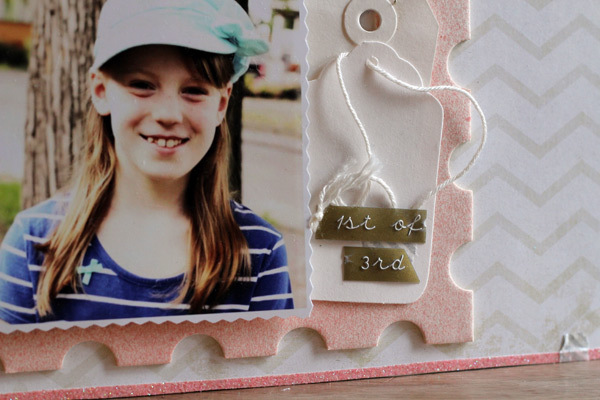 I am totally hooked on it, and only want to scrap square photos with pinked edges right now! Here you can see the small strip of pink American Crafts glitter tape across the bottom of the layout. I cut a thin strip off of a 12 inch piece and then adhered it across the bottom of the page. I seriously love this tape. This layout was the first time I used it, and I used it right away on the next page I was working on, too. Already planning on buying another package the next time I see it at TJ Maxx-Homegoods-Homesense-Winners. I stuffed a small white envelope and tags behind the photo. It felt like it was missing something, but only a very small something, so I added a heart I punched from some plain cardstock, and a couple of pieces of pale tape. The pink lace is from My Mind's Eye Reasons Why the Sweetest Thing set, and the pink dot on white is fabric tape. I love the texture and feel of a bit of crumpled paper on a page. I crumpled the date strip banner after I date stamped it. 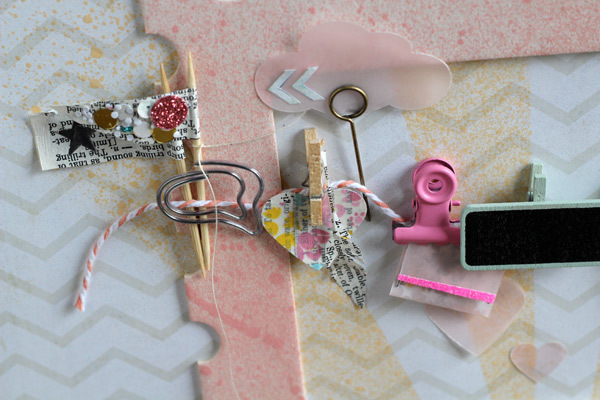 Including pieces like this on a page makes it feel like the layout has been made from real found pieces and scraps. I strung a piece of twine across the top of the postage frame and started hanging items on it. I didn't put much thought into whether or not anything of this stuff could actually hang, or would ever actually be hung on a line. 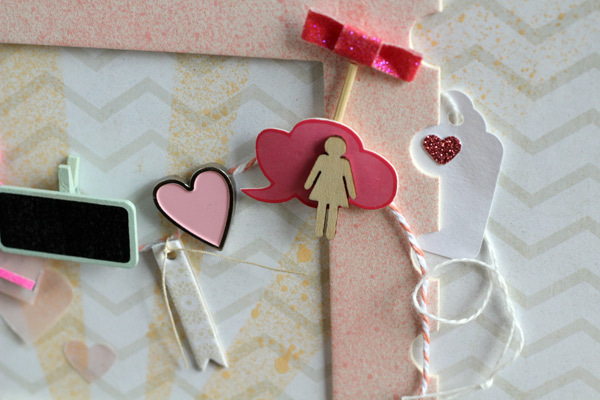 I gathered a bunch of embellishments that suited the colour and feel of the page. The speech bubble is from a Heidi Swapp Sugar Chic stix. I made the bow from more American Crafts glitter tape. 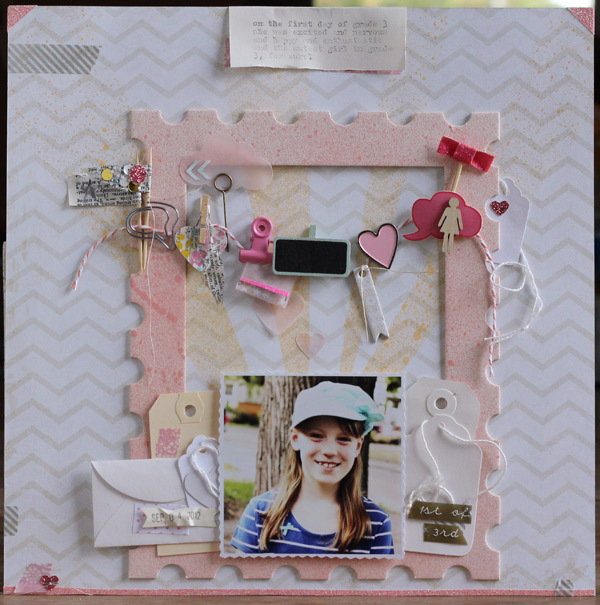 The cute little banner piece is from a My Mind's Eye the Sweetest Thing wooden button and chipdboard set. And a cute little girl wood veneer by Studio Calico. I seriously really love this little garland on this page. I made some little flags with dictionary pages and toothpicks and sprinkled one with confetti and put a silver star on the other. I had a piece of dictionary paper covered in My Mind's Eye The Sweetest Thing decorative tape left over from another project, and I punched heart out. The cloud is punched from pink vellum, and so are the two hearts. I adhered the hearts with a bit of ATG adhesive and it worked really well under the vellum! I really loved these speech bubble paper clips when I bought them, but this is the first time I've used them. Looking forward to using these again -- sometimes I just need to break the ice with a new product, and then I can finally get scrapping with it. I think one of my favourite parts of this layout is little pink envelope I made from vellum, clipped with the pink clip. I filled it with silver star confetti. The envelope flap is trimmed with a tiny piece of pink American Crafts glitter tape. So pretty! I LOVE how you used that postage stamp frame and how you hung the banner from it. Awesome layout! Awww, this page is awesome. I LOVE everything about it! That is fantastic. Love the frame. Just found you from the 2Peas thread and I am following now.